Made by Me. Shared with you. 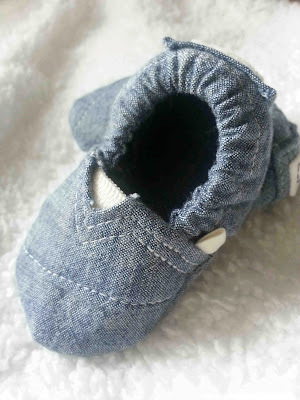 : Upcycled Chambray Baby "Toms"
Next up from the clothes pile, is a chambray shirt. It never fit my husband properly, so it hung in the closet most of the time. But, it has now become part of four different articles of clothing for my boys. 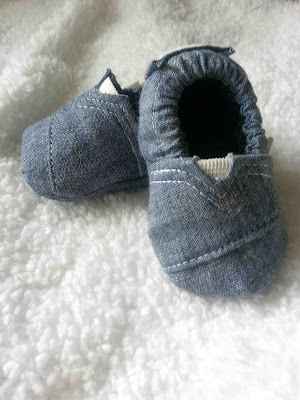 I made up these chambray baby "Toms" using Homemade Toasts' printable pattern. 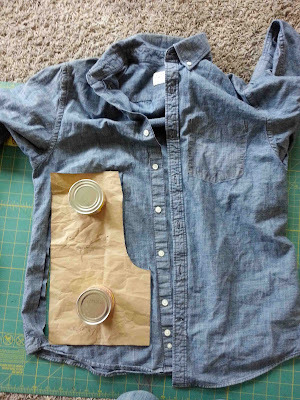 The basic printable pattern isn't scaled, so you'll have to do that on your own, or purchase her sized pattern. I love how these little kicks turned out. The elastic, double rowed stitching, and little tags. So cute. Hopefully my little guy can fit in them. My boys tend to have long feet. FYI: I didn't scale the pattern at all, and figure that it is probably close to a size one unscaled. I did have an issue with the uppers not meeting up in size when attaching them to the sole. It was probably due to a cutting error. It was a simple fix though, simply overlap the back heel over the toe piece a little more. If you have this problem, pin the toe piece to the sole, and then adjust the position of the heel before attempting to attach the two. It will help you find proper position, and eliminate seam ripping. Also, I didn't ever rip the seam of the toe piece. I inserted the tags prior to sewing the seam, and slipped the elastic in the side. 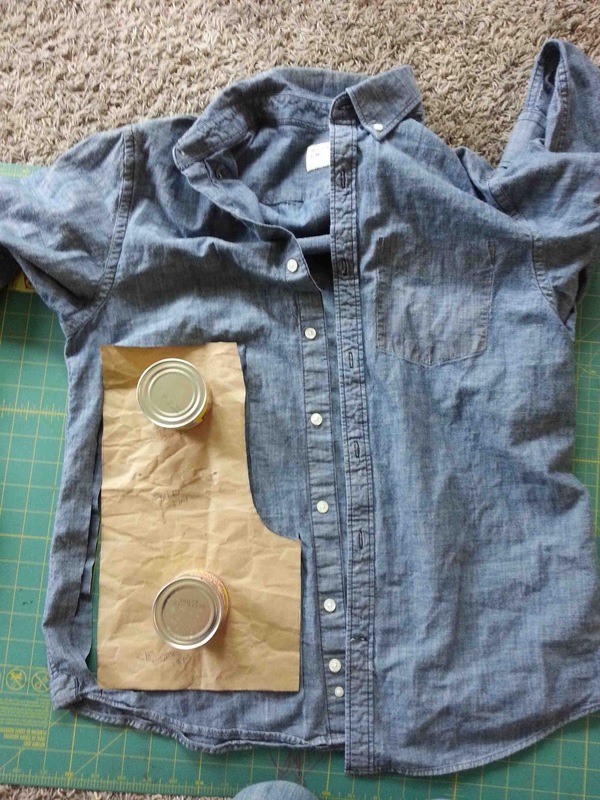 Tomorrow I'll show you the rest of the goodies made from the chambray shirt.